We are delighted that construction work has begun on creating a new community building in Chinnor, a large village which nestles just below the Chiltern Hills in South Oxfordshire. PCMS Design has been involved with the project from the outset, working in conjunction with Chinnor Parish Council to secure planning consent, and also to appoint a suitable construction firm. The contract was recently awarded to Princebuild Ltd of Peterborough, and their first task was to demolish the old sports and social club building on site which was beyond economic repair. 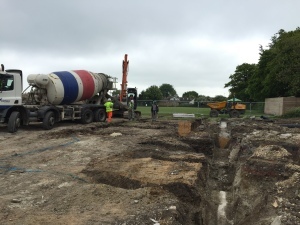 The foundations have now been dug for the new single-storey building, which will include well-equipped changing facilities for the nearby football pitches and tennis courts. There will also be function rooms for social activities and indoor exercise such as fitness classes, and a modern bar and kitchen. PCMS Design are project managing the whole build having previously carried out the design, specification and now the contract administration. It’s hoped that when complete at the end of this year, the new centre will become an active hub for the village and a meeting point for daily activities. 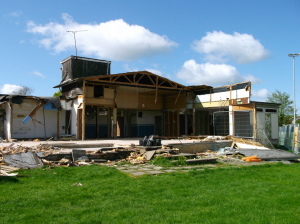 The photos show demolition of the old building, and foundation preparation for the new building.